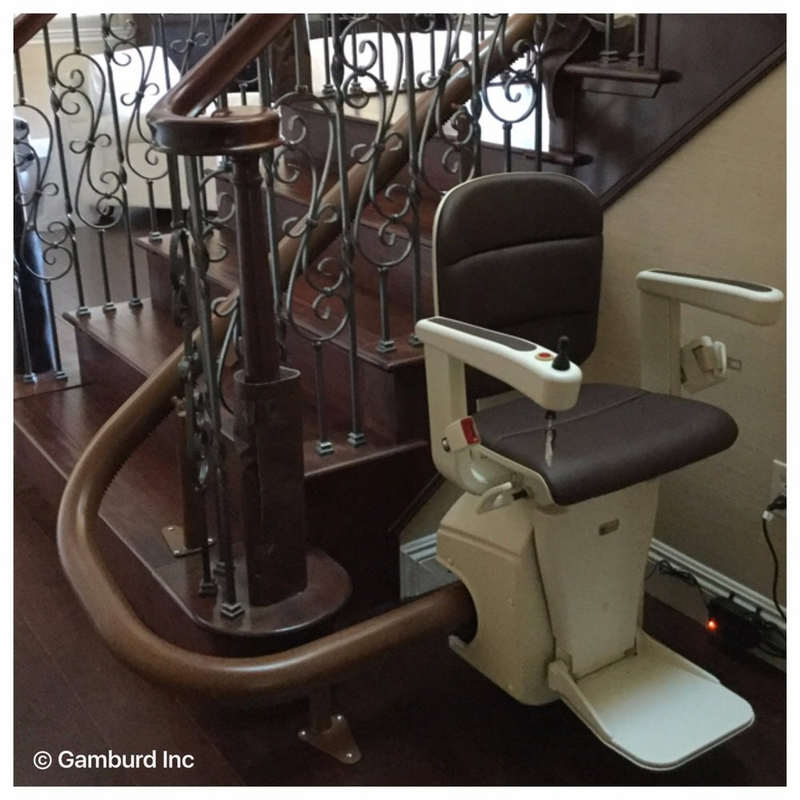 Which Custom Curved Stairlift is Right For Me? 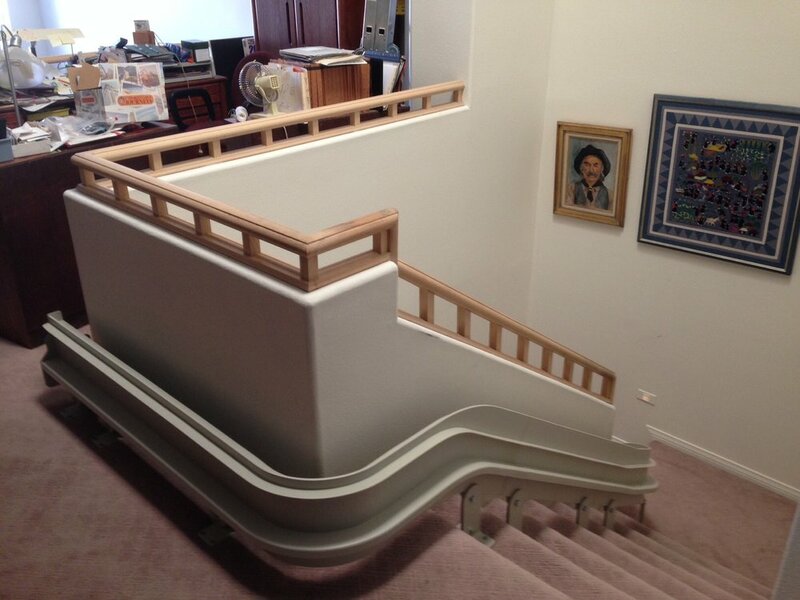 Single rail curved (Freelift) stairlifts are somewhat new in the industry. This design comes from Europe and incorporates a clean modern design and feel. Unlike the twin rail system which levels the seat based on the distance between the rails. This machine has a bit more technology in it. The unit has 3 motors and 2 circuit boards an rides on a rack and pinion system, however the leveling of the seat is controlled by a motor which counts the gears knowing exactly where it's located on the track and levels the seat. If for some reason the seat goes off level the chair will turn off. 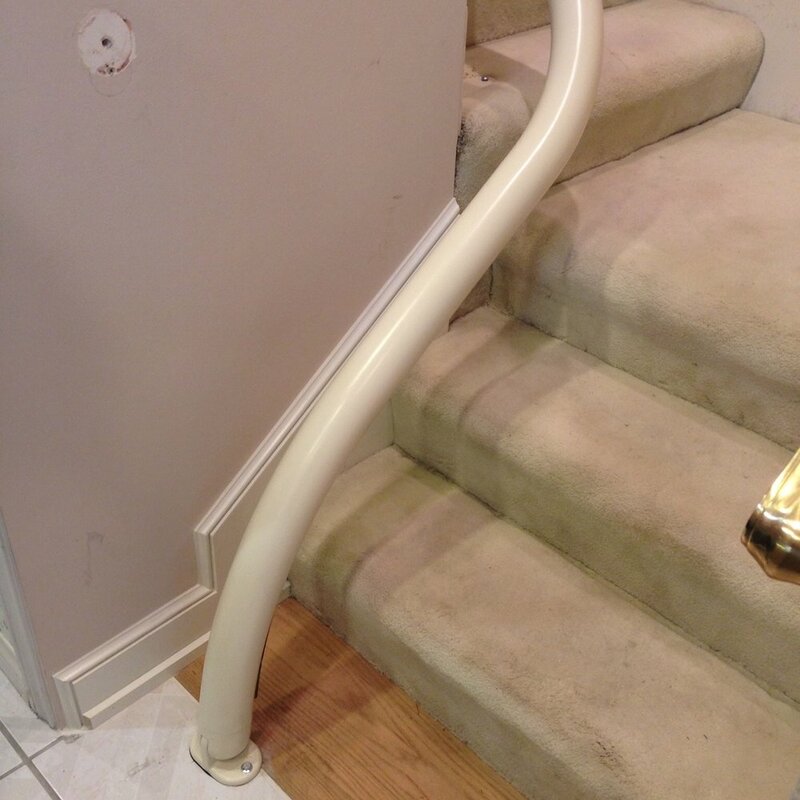 Based on this design of the Freelift, this stairlift can operate on steeper incline and will allow for an option called a drop nose which can keep the rail about 10-11" away from the first riser. In comparison with other stairlifts in the market that may extend between 20-25" past the first step, the Freelift shines. 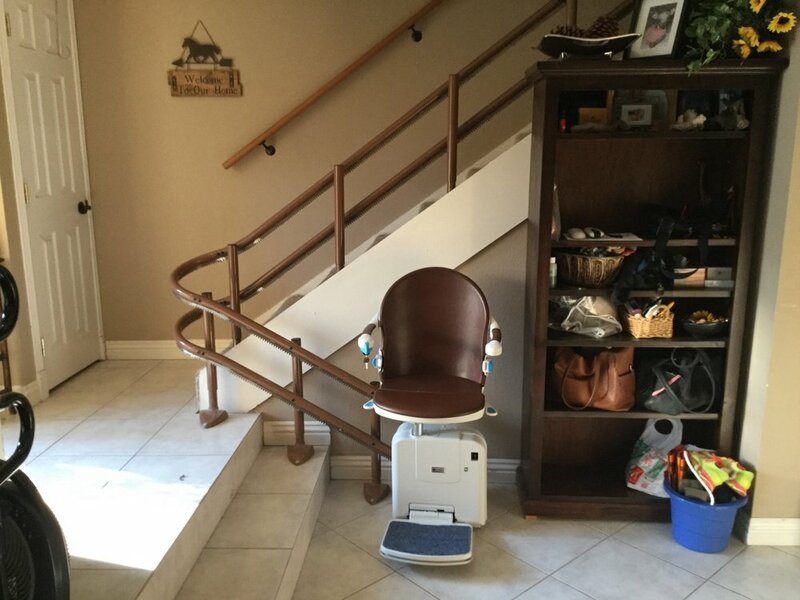 The Handicare Freelift curved stairlift comes with a rated weight capacity of 275lb. There are 3 color options at no additional charge; light grey, cream and coco brown. This is also for someone looking or a different color. The 180 turns are a bit wider then most curved lifts. To reduce the width its common for the manufacturer to raise the rail on one side and reduce it on the opposite side allowing extra rail to compensate for the distance. The unit is quite impressive considering that most stairlifts can ride up to a 50 degree slope, the Freelift can ride at a 60 degree angle. When it comes to a radius, its not a true round rail, we call it "Choppy Radius'. 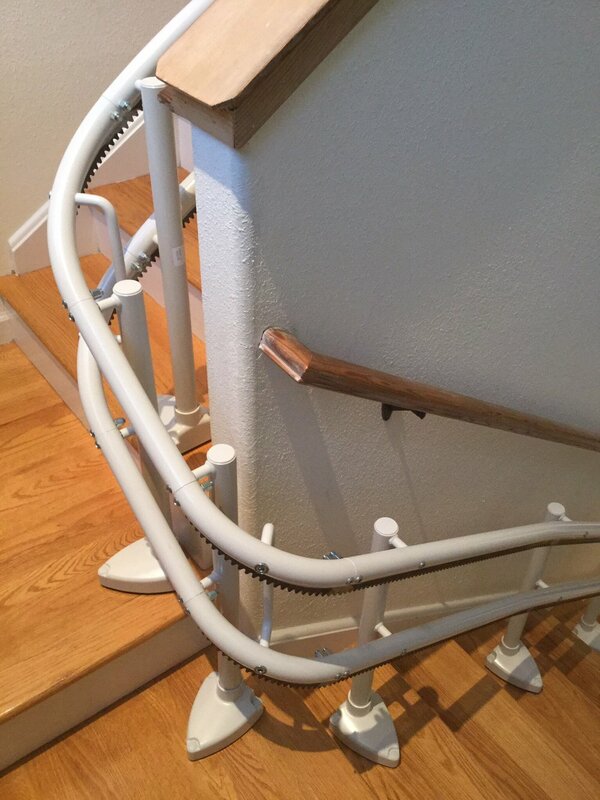 It comes in sections of straight rail, then a slight bend so you technically get a few sections of straight rails with bends along the way. If you are looking or a modern look and feel the Freelift is a great choice. The Bruno CRE Curved rail has been in production for over 30 years with very minimal change to the rail design. With a completely different rail system then any other lift in the market. The Bruno is not a round pipe design rather its a solid piece of steel with flanges welded on to it allowing the gear rack to be hidden. No matter what angle you are riding in, the track is the same size. The Bruno rail system is also the most difficult lift to manufacture and might cost a bit more then a tubular system. One of the downsides of Bruno is it doesn't offer a folding track or a reduced lower intrusion rail like the Handicare. The Bruno CRE rail extends approximately 20" in front of the first riser. The 180 and 90 degree turns are very attractive and almost look like molding. The Radius is a continuous gentle curve follow the exact measurements of the staircase. Bruno comes standard with a beige seat and rail but for an extra cost you can choose any color from a RAL chair. You may also do custom upholstery to and some texture and color to your chair. 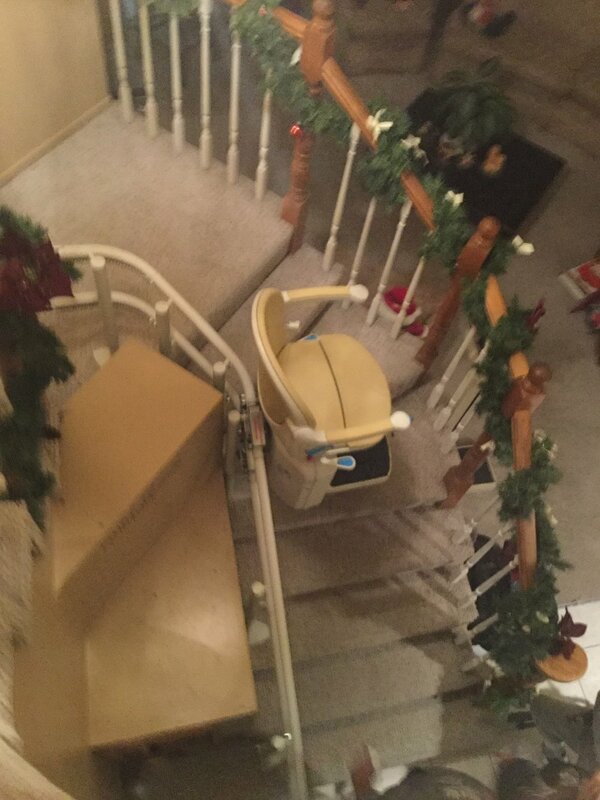 The Acorn curved stairlift is unique and different to all of the above stairlifts. With a unique modular design, Acorn can install a lift within just a few days unless the staircase is a radius. This concept makes a-lot of sense but comes at the expense of quality, speed, comfort and reliability. Acorn sells direct to the consumer cutting out a local dealer. In our opinion Bruno's model is a better model and customer are much happier. Dealing with a good local dealer will save you time and money since they know the local code and actually have a shop that is within a hour of your home. Imagine a Auto manufacturer working without local dealer where you can take your car into service. Instead you are dealing with a company based out of Florida. Whatever Happened to GI Joe?